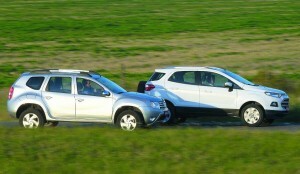 Ford EcoSport, though priced marginally higher than the Renault Duster in Brazil continues to sell more than the competition once again in April 2013. The American car maker Ford sold 6,397 units of the EcoSport in Brazil, French car maker Renault managed to put 4,050 units of the Duster SUV. Even in the month of March, EcoSport sold 4,496 compared to 2,282 and similar figures in january and february. Ford EcoSport will be launching in India during early June 2013 and will be having an option of two petrol variants and one diesel options. Now that even the brochures with variant wise details are out of Ford Ecosport, we do not need to tell it again to our fans. View the complete brochures of EcoSport here.